To change the text of the header, set the HeaderText property. If you set HeaderText to an empty string, the header does not appear. You can also hide the header by setting the ShowHeader property. 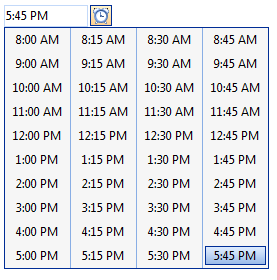 To change the range of times displayed, use the StartTime and EndTime properties. To change the interval between adjacent times in the time view, set the Interval property. The valid values are between StartTime and EndTime and less than EndTime - StartTime. To change the number of columns, set the Columns property. 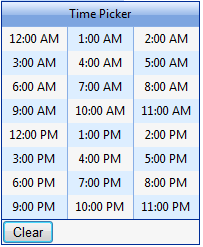 A TimeSpan array with the custom-defined time values. A DateTime array containing the user-specified time values.